What Would Downsizing Pennsylvania’s Legislature Actually Do? HARRISBURG, PA (WSKG) — While he was working on the US Constitution, James Madison realized there was a pretty fundamental part of state governments that seemed useless to regulate. Hundreds of years later, states are no closer to a consensus on what makes a legislature successful. That hasn’t stopped them from trying, however. 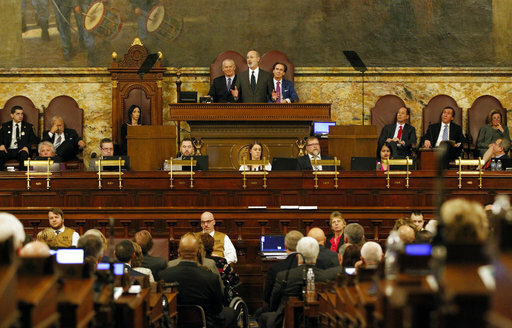 Pennsylvania’s House of Representatives recently approved a bill that could potentially amend the state constitution to shrink its own numbers. At 203 members in the House and 50 in the Senate, the commonwealth has the largest full-time legislature in the country. And they’re paid well too–lawmakers have the second-highest average salaries in the nation, behind only California’s much-smaller legislature. This isn’t the first time they’ve have tried to reduce their own ranks. But it’s the closest they’ve gotten in recent years. Representative Jerry Knowles of Berks County is leading the current effort. It would shrink the House by 52 members, to 151. Representatives also added an amendment to cut the Senate by 12, though it’s unclear if that will remain part of the proposal. Asked what makes the reduction necessary, Knowles, a Republican, turned to what he calls his fundamental principal. But why, exactly, is this a choice they need? Knowles gives a grab-bag of reasons. One of the popular arguments among small-legislature proponents is that shrinking the body would make it cheaper. Knowles’ bill is estimated to save somewhere around $15 million dollars annually. “Some people would say that’s not a lot of money when you look at a $32 billion budget, but my response to that is, that’s a lot of money where I come from,” he said. Knowles’ main reason for wanting to downsize, though, is a little more personal. Knowles’ opponents on the issue have just as many reasons for keeping the legislature as-is as he does for shrinking it. Some Democrats, like Montgomery County’s Mary Jo Daley, say it’s irresponsible to change the legislature’s size without fixing what they see as more fundamental problems. In a committee hearing, Daley tried to amend Knowles’ bill to create an independent citizens’ commission to handle state redistricting, instead of the legislature. “This kind of reduction in the size, without saying how it’s going to be done or leaving it to a different way–it’s more gerrymandering,” she said. A number of Republicans–largely from rural areas–oppose the change in size too. Indiana County’s Cris Dush has been one of the most vocal. Will shrinking the legislature save money? Make it harder to serve constituents? Create a more efficient government? Brenda Erickson, a senior research analyst at the National Conference of State Legislatures, said it’s ultimately really hard to tell. One example she looks to is Illinois. In the early 1980s, the state drastically cut down its House, from 177 members to 118. Like in Pennsylvania, proponents of the idea said it would save money. But Erickson noted, in a follow-up study about a decade later, it became clear that didn’t happen. “What they found is it did not save money. While they reduced the number of legislators, they increased the number of staff,” she said. At the end of the day, Erickson said the size of a legislature has much more to do with tradition than it does with some objective measure of efficiency. “Each legislature is unique. How they work, how their people want them to work. So a lot of this is driven by what the people of this state want their legislature to be–and that’s usually all set forth in their constitution,” she said. In Pennsylvania House floor debate on what to do, that often seemed to be the case. Lawmakers’ arguments on the big shrink were frequently emotional–like GOP Representative Jeff Pyle, a lawmaker from rural Armstrong County who left his sick leave specifically to vote against the bill. The Senate now has until summer to take the issue up. Senators don’t support the amendment that would shrink their own numbers. But GOP Leader Jake Corman said they haven’t discussed it as a caucus yet, and aren’t sure whether they’ll change the bill, vote it down completely, or just ignore it.